How accessible is your local police force? Is your local police force prepared for a situation that involves a deaf person? What about the interpreting provisions? What specific training is needed to improve interpreting standards that go on to protect deaf individual’s rights when it comes to accessing the justice system? The principle that every European citizen is entitled to equal access to justice is well established and is enshrined in EU legislation and case law. EU Member State’s Public service providers are under an obligation to ensure equality of provision of their services across language and culture. What does this mean for the average deaf European citizen? This means that your local Police Force is under an obligation to make reasonable adjustments to facilitate the provision of their service to deaf people. Before this can be acted upon police forces first need to know what equal access means, what steps need to be taken and how this can be delivered. Justisigns is a 30-month project funded through the European Commission Leonardo Da Vinci Lifelong Learning Programme, and the aim of the project is to promote access to justice for deaf sign language users, with a particular focus on police settings. Jemina Napier, Graham Turner and Robert Skinner from the Languages & Intercultural Studies department at Heriot-Watt University are conducting the project in collaboration with consortium partners: Trinity College Dublin in Ireland, University of Applied Sciences of Special Needs Education in Switzerland, KU Leuven in Belgium, efsli (European Forum of Sign Language Interpreters) and EULITA (European Legal Interpreters & Translators Association). The consortium has decided to focus on deaf people’s access to interpreters in police interviews for the next stage of the project until May 2016, as this is an under researched area. The goal of the project is to collect data through focus groups and interviews with deaf people, interpreters and police officers about their experiences. The information we gather will then be used to develop training materials and to offer workshops/ courses to these key stakeholder groups. By applying research in this way we can ensure deaf people and interpreters influence how equal access to the legal system is established. Lack of understanding and appreciation from the legal profession around what it means to be deaf and be part of a linguistic/cultural minority group. The awareness and need to use a registered/qualified interpreter who has been trained to work in court/police settings. In many cases CSW or family/friends were used to act as interpreters. Lack of training opportunities to prepare trained interpreters to effectively work in Court/Police settings. Treatment of deaf people as mentally disabled or “dumb”. Failure from legal professionals to make adjustments that enable the interpreter to do his/her job. Failure from legal representatives to video tape interviews with deaf suspects/witness/victims. Few deaf people understood their own legal rights. Deaf people do not always understand the reasons for their convictions – thus questioning the outcome of their “rehabilitation”. There is legislation in place that insists on equality before the law. It is recommended that only qualified interpreters are used in the legal system. Some interpreters have received legal training. Some police forces have in place policies to guide officers when it comes to interviewing deaf suspects/witnesses/victims. A few police forces in the UK have begun to develop online videos, recognising the specific linguistic and cultural needs of the deaf community. Deaf professionals are now working within the legal system. What our research so far reveals is that some forms of good practice exists. Unfortunately, we are not seeing a consistent approach to ensuring that the rights of deaf people are protected. Often good practice is achieved because individuals recognise the linguistic and cultural differences of deaf people. This tell us that what is needed is quite basic, a shared recognition and appreciation that deaf people belong to a distinct linguistic and cultural community. Once this definition has accepted the values of the legal system can begin to meet the needs of this community. The linguistic challenges interpreters experience in legal settings still persist, many of these challenges appear because of how the language is used and the vocabulary differences between English and BSL. The Justisigns work is not complete. We are still running further focus groups and interviews. To support our research we are looking for volunteers in Scotland and England to participate. If you would like to contact us about your experience please email r.skinner@hw.ac.uk. The evidence we collect will be used to inform the development of training materials and recommended guidelines for police forces. All information collected through the research will remain confidential. The project has received ethics approval from the Heriot-Watt University School of Management & Languages Ethics office. Previous blogs have reported how I am conducting research on experiences of language brokering in the Deaf community, which looks at the communication support that both deaf and hearing PDFs (People from Deaf Families) give to their deaf parents to communicate with hearing people. This is an under-researched area, I think mostly because of the taboos associated with kids ‘interpreting’ for their parents. Previous research has typically focussed on the negative experiences of hearing PDFs, the ‘conflict’ that arises for kids in taking on a language brokering role, without giving consideration to the deaf parents’ perspective or considering that deaf children (and adults) also broker for their deaf parents. So it is important to explore the positive and negative experiences from the perspective of all the people involved. So I am working in collaboration with two organisations: CODA UK & Ireland and Deaf Parenting UK, to jointly offer a workshop for children and their deaf parents as part of the project. The workshop will take place at the Rycote Centre, Parker Street Derby DE1 3HF on SUNDAY 29th MARCH 2015 from 10am-4.15pm. Using innovative arts-based research and visual research methodologies, encompassing drawing and photo-response (visual elicitation) tasks, as well as vignette methodology, the day will enable participants to explore their experiences of sign language brokering. These innovative methodologies have been previously used to explore child language brokering in schools in the UK and Italy with children from migrant families using various spoken languages. The day will involve an art workshop for kids (facilitated by me) and a discussion group for deaf parents, facilitated by Nicole Campbell who is Project Coordinator at Deaf Parenting UK. The workshop is *free*, and lunch will be provided. Families will be offered a £20 gift card to cover travel expenses, and there will be prizes for the kids. Deaf parents with deaf or hearing children are welcome. Maximum 20 places in each workshop, so register soon! You may have seen earlier blog posts from me where I discuss the research that I am currently leading on language brokering experiences in the Deaf community. In that research I am replicating the work that has been done on child language brokering with spoken language brokering to explore how, when, where and why it happens in the Deaf community, and the experiences language brokers in mediating information for their family members. The term brokering “focuses attention on the whole cultural meaning of such an event, in which any interpretation is simply a part” (Hall, 2004, p.285), and language brokering is typically conducted by children and young people that are more adept at a particular language than their parents, for example in migrant families where children may learn to speak the language of their new country more quickly than their parents. Child language brokering literature has identified that the typical age for children to begin brokering is 7 or 8 years old, once they have sufficiently acquired proficiency in the new language to mediate for their parents; and that children broker in a range of contexts, including medical, educational, retail and legal situations (Tse, 1996; Wiesskirch & Alva, 2002). In the Deaf community, brokering is performed by children with deaf parents. As they are exposed to both spoken and signed languages from birth, however, it seems that these children begin to broker as early as age 4 or 5 (Napier, in press). Children who are hearing that have deaf parents are typically referred to as Codas (Children of Deaf Adults), and there are organisations to support these people as kids and as adults to share their experiences (e.g., CODA UK &Ireland, CODA Australia, CODA International). Research has been conducted with Codas to explore their identity and describe their struggles with how they felt being ‘hearing in a deaf world’ (Preston, 1994; Adams, 2008). But it’s not a struggle for everybody. I am a ‘Coda’, but I have never felt comfortable with the term, as I have written elsewhere (Napier, 2008). Firstly, I am not a child, and my parents are not just ‘adults’, they are my parents. I don’t mind being identified as someone who grew up in the Deaf community, in fact I am proud of my language and cultural heritage, but the term ‘Coda’ conjures up too many pejorative connotations about kids taking on responsibilities to ‘take care’ of their parents from a young age through brokering. I also resist labelling of this kind as I believe that we all have multiple identities. Not only am I a daughter, but I am also a wife, a mother, an interpreter, a researcher, a teacher. My ‘Coda’ inheritance is only one part of my identity. Another reason that I am not comfortable with the ‘Coda’ label is the assumption that it is only hearing people that grow up with deaf parents that take on a brokering role. My research has shown that deaf people with deaf parents also broker – often because their language skills are better, or they can speak better than their parents, or are just more confident (Napier, in press, 2014). There is a term to refer to these people – as ‘Dodas’ (Deaf of Deaf Adults), and there is a closed group on Facebook, but it’s not a particularly popular term. And these people are typically excluded from Coda events and organisations. But they may well have similar experiences to share. I think it is important that both hearing and deaf people who have grown up with deaf parents should have their language and cultural heritage acknowledged, especially in relation to what they bring to the sign language interpreting profession, given that there is increasing recognition of the work of deaf interpreters (Adam, Stone, Collins & Metzger, 2014). I believe that, to quote a participant at the recent Association of Sign Language Interpreters UK (ASLI) conference where I presented, the term ‘Coda’ is “outdated and outmoded” (Jennifer Smith, Twitter [@jennifersmithuk], 28 September 2014). We also need to think more broadly about people who have grown up with sign language – not only with parents, but also siblings and extended family. So I suggest a new, more all encompassing, convention – to refer to “People from Deaf Families” (PDFs), which includes deaf or hearing people that have grown up using sign language regularly with one or more deaf members of their family. This term includes both deaf and hearing people, and also does not distinguish between children or adults, and does not focus only on people that have deaf parents. In the same way that it’s difficult to make changes to a pdf document, we can’t change who we are. Being a PDF should not be taboo. The professionalisation of sign language interpreting has meant more focus for training on recruiting L2 sign language learners in to the profession, which has been invaluable to the Deaf community. But we shouldn’t forget the deaf and hearing people that grow up in the community have a wealth of experience to bring (Williamson, 2012). Various authors (e.g., Stone, 2008) have discussed how the Deaf community are less engaged with selecting people to become interpreters, and many interpreter education programmes are trying to re-engage with the community through service learning (see Shaw, 2012). The swing to professionalism has led to a situation where it seems that PDFs are almost apologising for having sign language heritage. It could be seen that this is a form of intangible cultural heritage. I don’t want to be divisive. We all have the same goal in mind – let’s work together to provide the highest quality interpreting and translation services for the Deaf community. So let’s embrace deaf and hearing PDFs, recognise and value their heritage; in the same way we should recognise and value the life experiences of others who have chosen to learn our language and be a part of our community – they chose us. After holding a discussion group at the ASLI conference in September 2014 with sign language interpreters about the topic of language brokering, the majority of whom did not have sign language heritage, I first suggested this PDF term. Comments from the group were very positive and people responded well to this more all-encompassing term. In October 2013, Jemina made a post that gave an overview of ‘Who’s who?’ in the BSL team in the Department of Languages and Intercultural Studies (LINCS) at Heriot-Watt University. The blog introduced various members of staff and also PhD students whose topics focus on sign language related areas of research. In this blog we are delighted to announce that the team has expanded with an additional two deaf and two hearing people: three members of staff and one PhD student. We are all very excited to see the BSL team growing so rapidly. We now have eight members of staff and six (7) PhD students (staff member Gary Quinn is also doing his PhD part time). In addition to PhD student research topics on a description of prosody in BSL, job demands for interpreter educators, ethical discourse among sign language interpreters, the impact of interpreters on the practice of mental health professionals, sign language interpreting on television in China, comparative interpreting strategies of deaf and hearing interpreters and power and privilege in educational interpreting contexts, the team are working on a range of research projects, that investigate deaf jurors, legal interpreting across Europe (Justisigns), video remote interpreting and captioning for access to EU institutions (Insign) and sign language brokering, with plans for new projects in the pipeline to start next year. It is envisaged that with more staff and PhD students there will be greater scope to attract further research funding and embark on a wider range of projects. Below you will see a brief profile of each new member of the team, along with a link to a video clip where they introduce themselves in British Sign Language (BSL). Dr Steve Emery (deaf) is a BSL-using researcher who has joined the team as an Assistant Professor. His research interests focus on deaf citizenship, minority group rights and Deafhood and genetics. He has worked before at Heriot-Watt University and Bristol University as a postdoctoral researcher on various research projects, and also spent time at Gallaudet University as a visiting scholar. Steve will be teaching subjects primarily linked to Deaf culture and history, and Deaf people in society. Mark MacQueen (deaf) is a native Scottish BSL-using sign language teacher who has joined the team as BSL Language Assistant. After being thrown in at the deep end and starting to teach at Falkirk College, he later went on to work for the British Deaf Association in the delivery of their BSL curriculum. After studying linguistics and participating in the Heriot-Watt University Train the Trainers of BSL teaching course, Mark brings a wealth of expertise to the role. He now has over 14 years of experience of sign language teaching in a range of settings,and his priority is to ensure that Heriot-Watt BSL students develop a high level of fluency in BSL. Rob Skinner (hearing) is employed as a Research Associate on the Insign project funded by the EU DG Justice. He grew up in the Deaf community with deaf parents as a native BSL user, and has worked as a sign language interpreter for many years specialising in media/ TV, mental health, and video relay interpreting (at Sign Video). He has also worked as a research assistant at the centre for Deafness Cognition and Language (DCAL) research at University College London on various sign language related projects. Once Rob’s contract on the Insign project finishes in December 2014, he will be continuing work on the Justisigns project. Heather Mole has a background in BSL/English interpreting (a degree in Deaf Studies from Bristol University) and a masters in Disability Studies from Leeds University after which she was an adviser to disabled students in a university setting for 8 years. In that time she has reflected on the power dynamics of service provision and interpreting and plans to research the dimensions of power and privilege to see what impact they may or may not have on the interpreter. Back in March 2014 I reported on a new research project that we are involved in at The Centre for Translation & Interpreting Studies Scotland at Heriot-Watt University called the Insign project. This pilot project has been funded by the European Commission DG Justice to develop a platform to provide access to European institutions to deaf and hard of hearing people across Europe, either through sign language interpretation or respeaking/ captioning services. We are working in a consortium of partners with the European Union of the Deaf, Sign Video, IVèS, efsli, and Designit, and the project runs from January – December 2014. The Heriot-Watt University team includes myself, Professor Graham Turner, and Robert Skinner as Research Associate. The Heriot-Watt University team led on Task 1 – to review current practices world-wide through a combination of desk research to review existing policies, guidelines and research; and also through surveys with deaf users of telecommunications services, and interpreters with experience of working in video relay call centres. The Heriot-Watt University team are also involved in Task 4 – to evaluate the communicative aspects of the calls made during demonstrations of the platform. Our evaluations take place through observation, focus groups, interviews, and analyses of recorded calls. So far there have been two demonstrations: one at the EU Parliament in Brussels on 9th April, and the other at a workshop for participants attending general assembly of the European Union of the Deaf in Athens on 15th May. Basically we found that deaf users and interpreters have varied experiences with video relay services, but that in principle people are keen to see a service such as Insign, so that people can access European institutions in their preferred language and mode of communication. We have also completed a research update report, which summarises all the work we have completed on Tasks 1 and 4 during the first 6-months of the project from January to June 2014. The report provides recommendations on how the Insign platform can be improved to ensure a quality service, which will feed in to the final demonstration, and the final recommendations to the European Commission. The final demonstration will be at the EU Parliament on 25th September, and deaf and hard of hearing people are encouraged to attend. After a brief summer hiatus, LifeinLincs is back with plans afoot to rejuvenate the regularity of the blog posts…. In the meantime, I wanted to post an update about the deaf juror research that I am involved in with colleagues in Australia. I posted a previous blog about this topic in February this year, and have recently returned from Australia where we completed the data collection for the Australian Research Council funded project. The data collection involved the organisation of a mock trial involving 11 hearing jurors, a deaf juror and two sign language interpreters. The trial involved other participants who were genuine legal practitioners: legal aid solicitors, advocates and a retired judge. Two actors were hired to play the role of defendant and witness, and the case was adapted from a real drugs case tried originally by one of the advocates. The whole 1.5 day mock trial and 2 hour jury deliberation was filmed and all participants were interviewed on completion of the trial. We are now in the process of analysing the data, to determine the nature and level of impact that the presence of a deaf juror and interpreters may have on the jury deliberation process. The data collection went extremely well, due to the careful planning of the research team and the support from Legal Aid NSW in identifying a suitable case and legal personnel to participate, Deaf Australia to assist with recruiting a deaf juror, Sign Language Communications NSW and the NSW Deaf Society in providing the interpreters, the Australian Sign Language Interpreters Association (ASLIA) on advising on legal interpreting issues, and the NSW Department of Attorney General & Justice in securing us a courtroom to use at the Parramatta trial courts precinct. The research received a great amount of Australian and international media attention. 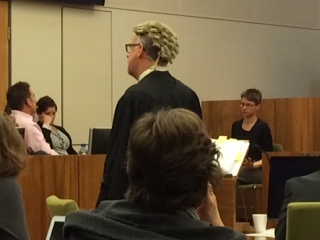 I was recently interviewed by Radio National New Zealand about the research and the mock trial. For people who can hear, you can listen to the interview (19 minutes long) at: http://www.radionz.co.nz/national/programmes/nights/audio/20146479/interpreting-legal-language. In order to provide access to the Deaf community to the interview, I have had it transcribed (thanks to our HWU research associate, Robert Skinner). The transcript can be found below. Apologies for the length of this posting, but this is the only way I can make the transcript available. This research has the potential to effect major international law reform, so is of interest to researchers and practitioners in legal, forensic linguistics, interpreting studies and deaf studies disciplines. 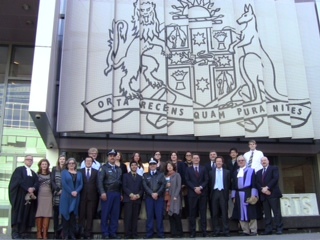 work has been in Australia encouraging the court system in New South Wales to embrace deaf jurors. Jemina is on the line now from Edinburgh, Scotland, cue to Jemina. Welcome to Nights. JN	Thanks very much for having me on. a jury in New Zealand? able to participate in the judicial process. involved in the court system there? back in Australia to do the last piece of the puzzle really. BC	Just looking at Australia for a start, what is the reason for excluding deaf people from juries? BC	Yeah, yeah, each State and Territory has its different court system. BC	That was the judge’s reasoning? Did a judge rule on this? JN	Apparently a court officer. Yeah that’s right, it was a court officer’s reasoning, yeah. surely a judge wouldn’t be that stupid? No. This is a bad call. the Rights of people with Disabilities if she doesn’t get through. is considered to be reasonable or not. trial. A ‘trial’ trial in Sydney is it? Using at least one deaf juror? for deaf people serving as jurors. We know this happens in the United States. people can in face serve as jurors. BC	What were you testing? What questions were you asking? let it go on ad infinitum. the content of that conversation and it’s usefulness? Did it take longer? takes a lot longer than sign language interpreting does. BC	What if some of the evidence, I don’t know if you’ve looked at this, is taped? conveyed. But I think that’s something the legal profession still needs to be convinced of. court? A New South Wales court? Because we’re dealing with just New South Wales here. interpreters in court. She was the first deaf person that I know of in Australia to be in that position. as revealing if we’re looking for the credibility of a witness. always regard the world visually. They’re always reading people’s body language anyway. deaf jurors. Are you still examining the results? Any conclusions yet that you can talk about? JN	I can’t really speak about any conclusion because the video footage is still being edited together for us. from the participants in the interviews that we did. BC	What did the other jurors make of what was going on? The ones that can hear? juror. If anything rather than be an impediment they found it enhanced the communication process. BC	How did the deaf juror feel about the situation and the process? almost always difficult, finds it tiring. It’s not an easy thing to do. soon for you to ne able to answer the question on whether you think that was the case. facilitate the communication between the people who need to directly address each other. BC	Did the mock trial reach the same verdict as the real case? JN	That’s a good question, actually no they didn’t. court establishment there, taken an interest in what you’re doing? too much of a vested interest. BC	Yeah that’s a bit too prejudicial I think. We’re hoping that maybe Gaye can be involved in a focus group at a later date? BC	You must be fluent in sign [language] yourself Jemina? New Zealand Sign Language as well! BC	Really we have dialects in sign? JN	We have different sign languages in every country, yes. languages form other countries are completely different. BC	When do you get your final results through? BC	March of next year? JN Yeah. Then final recommendations by the end of 2015. BC	Jemina thanks very much for joining us, I don’t know if you can hear me but you’ve suddenly broken up. We’ve gotta move on anyway, thanks very much Jemina. because at the moment they’re not allowed. Is it still "B"SL if Scotland votes 'Yes'? Fewer than 100 days remain until Scotland makes a weighty decision – to remain ‘United’ with the rest of the Kingdom’, or to strike out as an independent nation http://www.scotreferendum.com/. In the background of the democratic process lurk many questions about language. Scots, Americans, Australians and others routinely experience the dissonance of hearing their language called ‘English’. The same problem would start to apply to users of sign language in an independent Scotland – because their language is currently known as ‘British Sign Language’. So, when we gaze into our crystal ball, what can be foreseen in the event of a ‘Yes’ vote on September 18th? Odd as it may seem, scholars take the view that languages are not defined by their linguistic content, but by their socio-political status: “A language is a dialect with an army and a navy,” as Max Weinreich pithily declared. So if Scottish signers chose to exert their political muscles, they could start using the term ‘Scottish Sign Language’ tomorrow, if they wanted to, referring to the eloquent and powerful signing they already produce every day – and the language itself wouldn’t need to change one iota. Strictly in terms of linguistic structures, signing throughout these islands post-referendum is likely to remain more-or-less as united as it has previously been, no matter what the result of the vote. Languages change pretty slowly, after all. And as can be seen in the British Sign Language [BSL] Corpus (for which Heriot-Watt University was the Scottish partner), there is already significant regional variation in signing, including what are considered distinctly Scottish signs. That kind of variation comfortably exists within many languages – including English – without people feeling the need to change their view that ‘it’s all still one language really’. But politically, things may be different for communities in an independent Scotland. A lot will depend on social attitudes on both sides of the border. It’s possible that linguistic divisions may harden over time – but we’d be talking generations, not months. The other thing that is crucial is how key aspects of government policy in London and Edinburgh develop after the referendum. I published a paper in 2003 – “On Policies and Prospects for British Sign Language” – saying that one of the problems with making progress in improving BSL’s status is that the UK has always lacked any specific LANGUAGE policy about BSL. We have policies in health, social care, justice, education etc, all of which have implications for BSL – but nowhere do we take the language itself, and the signing community, as the focus for policy development. The result is the kind of incoherence and inconsistency we see in the Westminster government’s approach to BSL at present. Is that how things will continue if Scotland becomes independent? Some of the messages are discouraging. Scotland already has autonomy over its education policy (as part of the ‘devolved’ parliamentary arrangements) – but it cannot be said to have transformed the lives of Scottish Deaf young people as a result, as a recent report shows. So we can’t be complacent. On the other hand, the Scottish Funding Council provides ring-fenced resources which have allowed Heriot-Watt University to create a unique, full-time, 4-year degree course in BSL/English interpreting and to keep recruiting new students every year for the foreseeable future. So there are encouraging indications. And thanks to Mark Griffin MSP, the Scottish Parliament is due to consider a BSL Bill during 2014 – for once, putting the policy focus squarely on the language. That should be an encouraging signal that Scotland is moving towards seeing its sign language – whatever we call it – as part of its own cultural heritage, like Gaelic and Scots, to be treasured and protected. There are many topics one may be well advised to avoid in polite company – and here we are in polite company, so don’t ask me to name them. You know. But in this age of social media free-for-all, if people are discussing their lives in the blogosphere, is that material openly available to be treated as data by researchers? A recent paper (http://www.vakki.net/publications/2013/VAKKI2013_Dam.pdf) by Professor Helle Vrønning Dam, from the Department of Business Communication at Aarhus University in Denmark, has stirred up a degree of controversy among professional translators. Professor Dam’s (http://pure.au.dk/portal/en/persons/id(a0254d63-e724-4476-bd70-5b7642cf0e53).html) work (2013) describes an ongoing project analysing translators’ self-presentation in their weblogs. Some 21 freelance practitioners are said to “use their weblogs to enhance their own and their profession’s status and, ultimately, seek empowerment”. The paper is characterised by the author as an illustration of ‘the translator approach’, “a new research perspective in translation studies that posits translators, rather than for example translations or translating, as the primary and explicit focus of research”. I’d be the last to knock any researcher who wants to keep real human beings squarely in focus. There are more than enough analysts out there who appear content to reduce the soul to a desiccated set of metrics (http://www.nytimes.com/2014/05/18/fashion/the-united-states-of-metrics.html?smid=fb-share&_r=0). But if this is ‘new’ to translation studies, it really shouldn’t be. And there are models available that would help enormously to overcome the disconnect between researcher and researched that seems to have caused friction (https://www.facebook.com/groups/extraordinarytranslators/) among some readers of Dam’s study. “People are not objects and should not be treated as objects. Subjects have their own agendas and research should try to address them. Elegant and brilliant. I am convinced that, taken in a serious and considered manner, these principles really work. They have for me for over 20 years. The beauty of them in the human sciences is that, at a stroke, they enhance both aspects of the equation – our humanity and our science. Have they been applied in our field? Well over a decade ago, I led on a paper called ‘Issues of Power and Method in Interpreting Research’ (see http://www.routledge.com/books/details/9781900650441/ for details) which wears its debt to Cameron et al quite explicitly. The work of Heriot-Watt’s Centre for Translation & Interpreting Studies in Scotland (www.ctiss.hw.ac.uk) has underscored this approach in many ways. ‘Empowering’ methods are highlighted in our Summer Schools (http://www.sml.hw.ac.uk/departments/languages-intercultural-studies/edinburgh-interpreting-research-summer-school.htm) and publications (eg https://benjamins.com/#catalog/books/btl.99.11hes/details). So empowerment of practitioners by practitioners, as Dam discusses, is one significant step. But it is also eminently possible for researchers and practitioners to combine forces for mutual benefit. And the ultimate target is, of course, a ‘cycle of empowerment’ (as described here https://benjamins.com/#catalog/books/btl.70.21tur/details) which advances the interests of both groups, plus – most importantly of all – the service users in whose interests interpreters, translators and researchers are all ultimately operating. Do you have deaf parents that use sign language? Have you had experience of helping your parents to communicate with hearing people or translating information for your parents? Language brokering is something that children do to help their parents with communication, for example, if the family has migrated from another country and the parents don’t speak the language. Children can learn new languages more quickly than their parents, which is why they will help their parents to communicate in different situations. Research has shown that children in the UK who speak a different language at home with their parents, like Chinese or Polish, often broker for their parents in different situations, like at the bank, the shop, at school or at the doctor. They can also broker by telling their parents what letters say, or information brochures, or help them fill in forms. This research has also shown that children who broker for their parents have different feelings about it – some feel good about it, some feel not so good about it. We know that hearing and deaf kids who have deaf parents that use sign language also do this ‘language brokering’. But we don’t really know much about where it happens or why, and how the kids feel about it. We also know that even when people are grown up, they still broker for their deaf parents. So this is a new project to find out about sign language brokering in the Deaf community in the UK. We want people to tell us about their experiences. The project has different stages – we have already done a survey of 240 deaf and hearing Codas from 14 different countries and found that many of them began brokering as early as 4 or 5 years old. They also said that they broker in different situations, like other kids with spoken languages. We have also interviewed 11 people in Australia, ranging from 13 years old to over 50 years old, who have talked to us about their language brokering experience. For the next stage of the research we are holding an artwork competition – so you can draw a picture, take a photo or make a short 5-minute movie to show us how you feel about your sign language brokering experience. We want deaf and hearing kids and adults to submit your artwork. All the submissions will be judged by a panel of deaf and hearing people that have deaf parents or are involved in the Deaf community. There will be 9 prizes of a £50 gift voucher for one person in each age and submission category. Winners will be emailed with a voucher. Each piece of artwork will be analysed to get an understanding of how people feel about their sign language brokering experiences in the Deaf community. So that children, deaf parents and other members of the Deaf community, hearing professionals that work with deaf people, and interpreters can benefit from this information, we would like to share this artwork with different audiences in different ways: like on a website or at an artwork exhibition. We will only show your artwork with your permission. 1. This competition is only open to UK residents. 3. There are three artwork categories: (1) Draw/ paint a picture, (2) Take a photo, (3) Make a short movie. 4. Movie submissions should be no longer than 5 minutes long and should ideally be provided through a link to a YouTube or Vimeo clip. If USB sticks or DVDs are posted, they cannot be returned. 5. Deadline for competition entries is MONDAY 30th JUNE 2014. 7. All entries must include a submission form. If no form is included it will not be entered into the competition. This project is being managed by Jemina Napier, who is a sign language interpreter and researcher and also teaches interpreters. Jemina is hearing and grew up in a large deaf family in London, so has used British Sign Language all her life. This project is also being carried out with support from key organisations who represent the Deaf, sign language interpreting and Coda communities, including: CODA UK & Ireland, the Association of Sign Language Interpreters (ASLI), the Scottish Council on Deafness (SCOD), Deaf Parenting UK and the British Deaf Association (BDA). It is vital to carry out this project in collaboration with the Deaf community, deaf parents and sign language interpreters in order to ensure that the communities can directly benefit from the research findings. If you have any questions please contact the project manager Jemina Napier by email – childlanguagebrokering@gmail.com and she can answer your questions by email or arrange a skype conversation if you would prefer to talk in BSL. Pioneered in Sweden, both video remote interpreting (VRI) and video relay service (VRS) platforms use web-based video technology to enable Deaf and Hard-of-Hearing (HoH) sign language users to talk to (hearing) non-sign language users using their preferred language (i.e., a signed language) via an interpreter, either with the interpreter situated remotely and the deaf and hearing person together in the same room (VRI) or the deaf and hearing people in different locations with the interpreter in a call centre (VRS). VRI and VRS is increasing exponentially worldwide, and as a result there is a growing area of research that investigates communication through VRI and VRS from linguistic and sociological perspectives (e.g., Taylor, 2005, 2009; Quinto-Pozos et al., 2010; Brunson, 2011; Napier & Leneham, 2011, Alley, 2012; Napier, 2013). Insign is a new pilot project that was launched in December 2013 to develop a web-based service platform, enabling European Deaf and HoH citizens to communicate independently and to contact their EU Institutions and MEPs. The platform (known as a Total Conversation platform) will offer the option of communicating via a sign language interpreter and/or real time captioning. The Insign project is funded through the DG Justice of the European Commission and is led by the European Union of the Deaf with a consortium of organisations from four European member states (Sign Video, IVèS, efsli, Designit) and including BSL researchers in The Centre for Translation & Interpreting Studies Scotland at Heriot-Watt University. The project methodology involves key stages to review existing VRI/ VRS practices, develop the platform, demonstrate and test the platform, and make recommendations to the DG Justice for future implementation. Heriot-Watt University’s role is to provide the research evaluation component of the project. The Principal Investigator is Prof Jemina Napier, working with Co-Investigator Prof Graham Turner, and Research Associate and experienced VRI interpreter Robert Skinner. (1) It is the first VRI/ VRS of its kind to provide access to deaf people in more than one spoken-signed language pair. All other services focus on national spoken and signed languages (e.g., English and British Sign Language in the UK). Insign, however, will involve the provision of 6 signed languages: British Sign Language, Dutch Sign Language, French Sign Language, Hungarian Sign Language, Spanish Sign Language, and International Sign; and 5 spoken languages: Dutch, English, French, Hungarian, Spanish. (2) It is the first international research study that will have access to natural (not simulated) data of VRS calls between Deaf sign language users and hearing people, as well as data from surveys and interviews with Deaf people, interpreters and captioners/re-speakers. The first stage of data collection has begun, with the launch of a survey questionnaire to collect views from Deaf sign language users, interpreters and re-speakers on general VRI/VRS service experiences and the need for a specific EU-based solution. You can participate in the survey by clicking on one of the following links – depending on whether you are Deaf or HoH person, an interpreter, or a re-speaker. Each of the surveys is in English, and the survey for Deaf and HoH users is also available in International Sign (IS) with the option of having a follow-up conversation in IS by Skype. The results of these questionnaires will feed into the development of the Insign service, which will be demonstrated and tested throughout the year. One of the key principles of this project is to involve the key stakeholders in informing the development of the service and to evaluate the feasibility and sustainability of such a multilingual service. This especially includes Deaf sign language users and sign language interpreters.